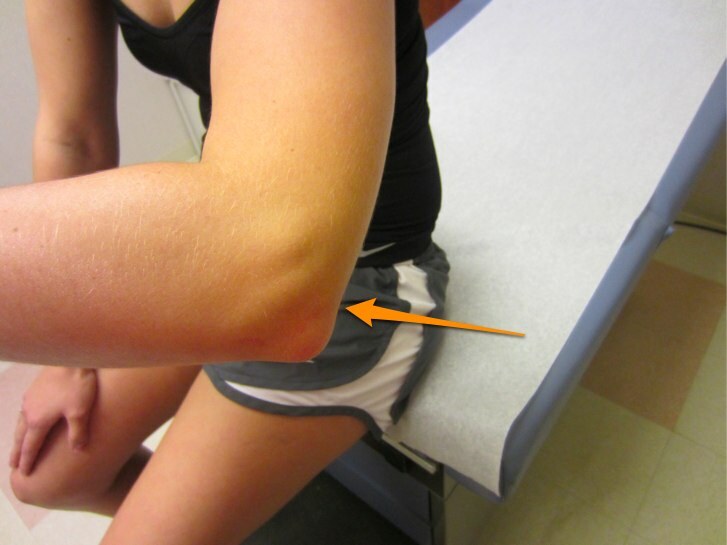 A triceps tendon rupture is an uncommon injury to the elbow that can be very debilitating. The triceps tendon is the large muscle in the back of the upper arm that serves to straighten the elbow. The triceps tendon attaches the triceps muscle to the olecranon (the bony tip of the elbow). Injury to the tendon is almost always traumatic and requires a significant amount of force. The mechanism usually involves a force that suddenly bends the elbow while the muscle is trying to straighten it. It can occur in weightlifting or in contact and collision sports such as football. The athlete who has torn his triceps tendon will have a noticeable defect just above the olecranon (orange arrow). Injury to the triceps tendon is almost always traumatic, and the athlete will know immediately that a serious injury has occurred. Often he will describe feeling or hearing a pop in his elbow. A physician examining the injury will notice swelling and often bruising at the back of the elbow and upper arm almost immediately. Usually a defect just above the olecranon where the tendon inserts can be felt. The athlete will usually have weakness trying to straighten the elbow against resistance. The physician will usually order x-rays to determine if the injury pulled a piece of bone off the olecranon. Occasionally an MRI is ordered if the diagnosis is unclear. Treatment involves surgery to repair the tendon. The surgeon will make an incision over the back of the elbow to expose the ruptured tendon and repair it to bone. The repair involves placing stitches in the tendon and anchoring them to the tip of the elbow either with suture anchors or through tunnels drilled in the bone. As with most tendon repairs, the surgeon then has to get the tendon to heal in that position. Healing involves immobilizing the elbow to prevent stress on the repair for several weeks. Gradually motion is started slowly and progressed over many weeks. When full motion of the elbow has been restored, strengthening of the triceps muscle and other muscles of the upper extremity is started. Unfortunately, the full recovery process is a long one. Return to sports can take many months, and therefore this is usually a season-ending injury.